The Indian Regional Navigation Satellite System (IRNSS), which is being developed for positioning services in and around India, is the latest addition to the global family of satellite-based navigation systems. As IRNSS only shares the L5-frequency with GPS, the European Galileo, and the Japanese Quasi-Zenith Satellite System (QZSS), it has at least at present a limited interoperability with the existing systems. 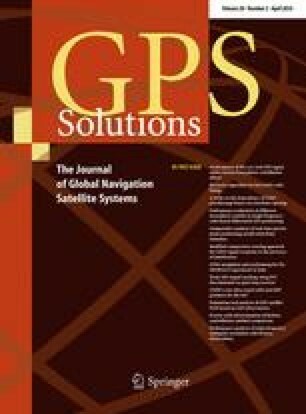 Noting that the L5-frequency capability is under development even for GPS, this contribution assesses the interoperability of the IRNSS L5-signal with the GPS, Galileo, and QZSS L5/E5a-signals for positioning and navigation using real data collected in Perth, Australia. First, the noise characteristic of the IRNSS L5-signal and its comparison with that of the GPS, Galileo, and QZSS L1/E1- and L5/E5a-signals is presented. Then, the L5-observables of combined systems (formed from IRNSS, GPS, Galileo, and QZSS) are assessed for real-time kinematic positioning using the standard LAMBDA method and for instantaneous attitude determination using the constrained LAMBDA method. The results show that the IRNSS L5-signal has comparable noise characteristics as that of the other L5/E5a-signals. For single-frequency carrier phase-based positioning and navigation, the results show better ambiguity resolution performance of L5/E5a-only processing than that of L1/E1-only processing. This work has been executed as part of the Positioning Program Project 1.01 “New carrier phase processing strategies for achieving precise and reliable multi-satellite, multi-frequency GNSS/RNSS positioning in Australia” of the Cooperative Research Centre for Spatial Information (CRC-SI). The third author P. J. G. Teunissen is the recipient of an Australian Research Council Federation Fellowship (Project Number FF0883188). A development version of firmware for JAVAD receivers was kindly provided by JAVAD GNSS Inc. All this support is gratefully acknowledged.